Many consumers these days are opting to purchase a carpet sweeper as a quick alternative to clean the carpet, instead of dragging out their bulky vacuum cleaners. For in between cleans or quick tidy ups, these gadgets are not only lightweight, but they are also easy to use and versatile. 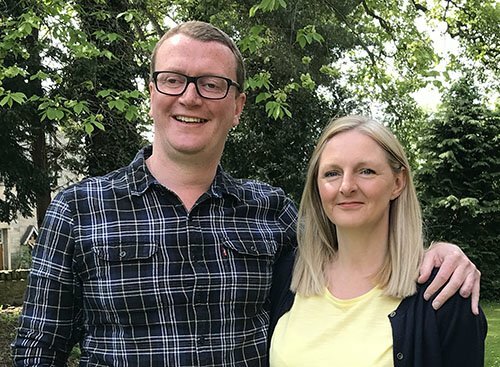 Gone are the days of the clunky old carpet sweepers which only brushed away minute amounts of dirt from the surface of the carpet – that’s if they even worked at all! These days, carpet sweepers are designed with the user in mind and have the power to pick up larger particles as well as ground in dirt. 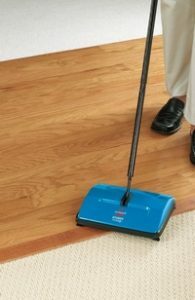 The Bissell Sturdy Sweep is ideal for quick clean ups and in between vacuums. It offers a 5 brush system – the main brush for the bulk of the clean up, and 4 edge cleaning brushes for all the hard to reach areas, such as corners and edges. Being a manual sweeper there are no annoying cords which makes it super convenient to use. This sweeper can be used on all floor surfaces and automatically adjusts to suit. The large capacity means it doesn’t have to be emptied as often, and with heavy-duty steel construction, this little gem will last for the long haul. 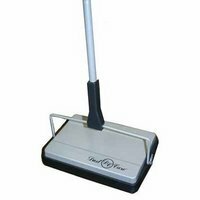 The Ewbank Speed Sweep Carpet Sweeper is lightweight and offers a wide 8 inch sweeping capability, to make any job a breeze. The fold down handle allows an easy clean under furniture, and the smooth glide ensures easy pickup. The sweeper is also manual, making it ideal to freshen up your carpets before the guests arrive or to effectively tidy up an unexpected mess. Unlike some other sweepers, pet hair isn’t a problem for this model which is an added bonus for those with furry friends. Black in colour, the Ewbank Speed Sweep Carpet Sweeper will suit any home decor, with an extremely affordable price to suit any budget. 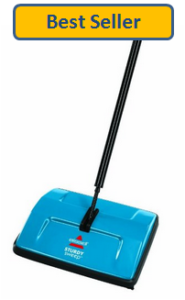 This sweeper delivers the quality that Bissell is renowned for, without the price tag. Made from 100% recycled plastic, this light-weight option is also PVC free, which makes it a great environmentally friendly choice. There are 2 brush rolls; one for picking up larger debris and the other for picking up finer particles. The 4 corner brushes are perfect for getting into corners with ease. It can be used on any floor surface and with twin dirt tanks, emptying couldn’t be easier. 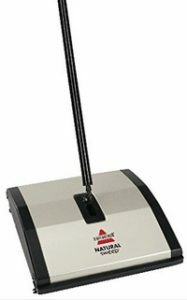 As far as convenience goes, it doesn’t get much better than the BISSELL Natural Carpet Sweeper. 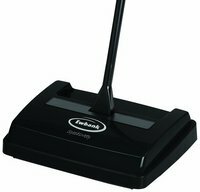 As the name suggests, this sweeper is great for both carpeted and hard floors – making it ideal for any room of the house. With 3 rows of sturdy brushes, pet hair, fluff and dirt are effortlessly picked up. The metal handle and metal bottom plates make this a durable option for either residential or commercial use. The head opens on both sides for easy cleaning and the additional clean out comb makes it even easier. In the world of carpet sweepers, the Dustcare Lightweight Carpet & Hard Floor Sweeper is a worthy contender, both in terms of price and in quality. As with other Ewbank models, this sweeper is light-weight while still offering an effective clean on both hard floors and carpets. The transition between floor types couldn’t be simpler, with the adjustable height setting making the Ewbank Evo 3 Carpet Sweeper incredibly versatile. The larger capacity dustpan reduces the time between emptying and is made even more hygienic with the waste emptying control being at the top. This manual sweeper does away with messy cords and delivers an effective, silent clean. The tough synthetic brushes and sturdy metal handle ensures that this sweeper will provide many years of use. With so many options on the market, it can be a daunting task to choose the carpet sweeper that is best suited to your needs. There are, however, a few key points to consider when making your choice. The whole purpose of a carpet sweeper is to be used quickly and easily, and it’s for this reason that the size of the sweeper is important. If you have larger areas to be cleaned, a larger head and brushes will make for a faster and more convenient clean. For smaller spaces, a more compact model may be an option. Height adjustment is also crucial, not only for ease of use for the whole family but also to make the cleaning process more comfortable and prevent unnecessary back strain. Different homes have different needs when it comes to cleaning. For example, a large family with pets who spend a lot of time at home may need a more heavy duty sweeper. The number and size of the brushes, and also their functionality varies between brands and models, making this one of the most important aspects of your purchase. Manual or Electric Carpet Sweeper? 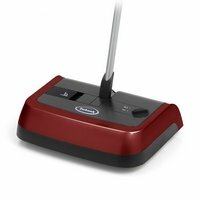 These days carpet sweepers come in both manual and electric varieties, with some having a rechargeable battery for cordless convenience. Both options have their perks and it comes down to personal preference as to which one suits your household. If you don’t fancy having to worry about running out of battery power, the manual options are quite impressive and often work just as well as the powered varieties. The way in which your carpet sweeper will be used is another key factor in choosing which type is suitable. Sweepers specifically designed for commercial purposes tend to be more durable as they are intended to be used more often, and generally for harder to clean areas. One of the biggest defining factors in any purchase is the price, and a higher price doesn’t necessarily mean a better product. Prices can often differ greatly between different brands and models, so it pays to do your research and determine what each sweeper has to offer.